City of Estevan Leisure Services Division has been busy planning and preparing to Velcome you to Affinity Place. 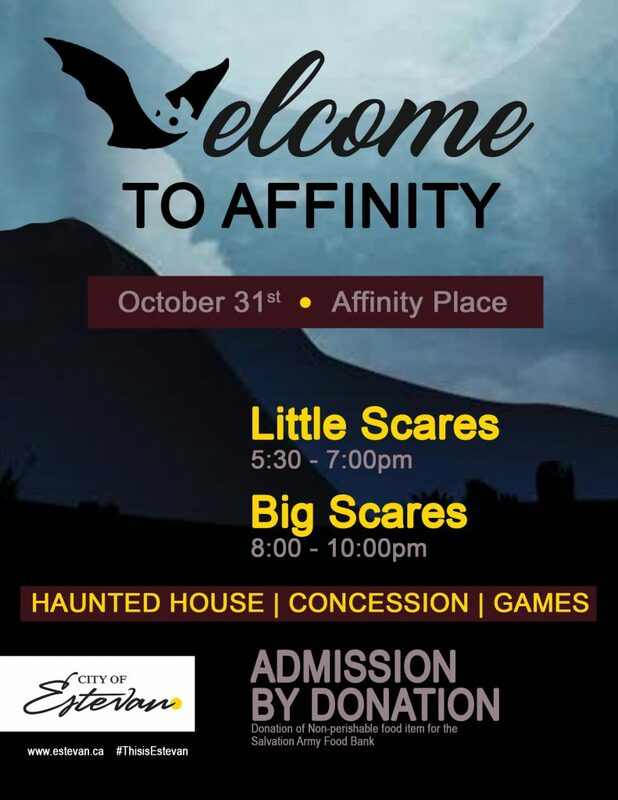 Affinity Place will be transformed on October 31st for a FREE Halloween Event for all ages. Admission is by donation of a non-perishable food item for the Salvation Army food bank. “Velcome to Affinity, will have two different levels of ‘scares” said Erin Wilson, Program Manager for the City of Estevan Leisure Services Division. “There will be Little Scares for those that don’t want to be too scared and Big Scares for those people that love jump scares.” The Little Scares will run from 5:30-7:00pm and the Big Scares from 8:00-10:00pm. Your little ghosts and goblins will be guided through different themed rooms throughout Affinity Place. The concession will open for those that need to grab some supper and head back out trick or treating and there will be games for those that want to come and warm up. Let’s get spooky on October 31st.